The Orlando Sentinel is reporting that NASA wants to build a space station about 277,000 miles from Earth, placing it well beyond the orbit of the Moon. Called the "Gateway Spacecraft," the outpost would support a small astronaut crew and serve as a staging area for future missions to the Moon, Mars, and potentially beyond. To save on costs, NASA is hoping to construct the spacecraft with parts left over from the International Space Station, as well as hardware provided by Russia and Italy. It would be positioned at the EML-2, or Earth-Moon Lagrange Point 2, a location about 38,000 miles from the moon. At this spot, the combined gravities of the Earth and moon create an equilibrium point, that would allow NASA engineers to position the spacecraft with a minimal amount of power required to keep it in place. In terms of getting there, NASA is likely going to use the Orion-SLS rocket currently under development. If all goes according to plan, the rocket will have its inaugural launch in 2017, with construction on the Gateway starting in 2019. The Sentinel is reporting that the concept has been under study for months, and that NASA Chief Charlie Bolden visited the White House earlier this month to make his pitch. It's not clear, however, how the proposal was received. It's thought that the budget of such a project could exceed billions of dollars. Aldrin has long urged NASA to set up a similar "floating launching pad" at a different balance point between Earth and the Moon, called EML-1 or L1, and this weekend he said that platforms at L1 or L2, plus fueling depots for spaceships, would serve as appropriate "intermediate steps" for voyages to Mars and other worlds. "It's part of my unified space vision," he told me during an international gathering of spacefliers and mission managers at Seattle's Museum of Flight. Aldrin's vision calls for NASA to lead in the construction of the infrastructure needed for space transport beyond Earth orbit, while leaving the development of facilities on the Moon's surface to commercial ventures. 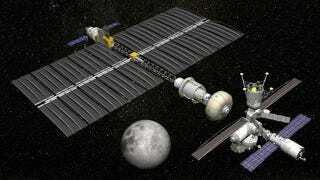 A human-tended station at EML-1 or EML-2 could help direct the robotic construction of habitats and factories on the moon, to be occupied at a later time by humans. "Those are steppingstones in confidence and training for interplanetary spacecraft," Aldrin said. The eventual goal would be to have a human-tended station on the Martian moon Phobos, directing robots to build facilities for permanent residents on the Red Planet. And then? "We make a commitment to permanence," Aldrin explained. "It's like the Pilgrims on the Mayflower." But as Boyle correctly concludes, the entire issue will ultimately come down to affordability. Seeing as NASA is already spending $18 billion on the Orion system, the federal government may be hard pressed to justify more spending during tough economic times — and as the private sector starts to make its mark in space. Sources: Orlando Sentinel, NBC. Images: NASA / Boeing via NASASpaceflight.com, David A. Kring / LPI-JSC Center for Lunar Science and Exploration.